Straw Mulch in Fall - Walt's Organic Fertilizer Co.
Mulching for Winter with Straw – one bale will be great for 100 to 200 square feet plot. Last year we put two bales on our 200 s.f. plot but have stretched one bale over this area. We usually move the bale into an open spot in the planting bed and cut it open. 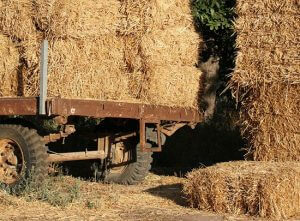 Then loosen the sheaves and tuck it around over-wintering crops. I’m guessing this ends up being around 3-6 inches deep (loose and fluffed up). If you’re overwintering a number of hardy annuals and maybe some perennials, you will have less exposed soil surface so you will need less straw. Our Winters are pretty mild so it doesn’t take a lot of mulch to adequately blanket the soil. In advance of a deep freeze you might want to rake some extra around more sensitive plants. Or, you may want some extra on hand to fill things in mid-Winter. We currently have two-string bales of organic white wheat straw available. In our opinion, it is quite clean of seeds. Pick up at our shop Tuesday through Friday 10-6 and Saturdays 10-4 through October. November through January hours reduce to just Fridays and Saturdays.